It’s Tuesday, June 23, the height of strawberry season, and we are finally rewarded with a sunny day for picking after a weekend of heavy rains. My daughters and I are headed to the local “pick your own” farm to gather our year’s worth of the delicacy. This is an annual tradition for us that has become even more important to us in recent years as we have committed to eating as much local food as possible. My older daughter is 10 and has matured into a fine strawberry picker instead of just a strawberry eater, making my job much easier. The scorching sun is on my back as I kneel in between the rows of vegetation, being careful not to land my knee on a fallen strawberry. The quarts fill quickly and easily as I enjoy some much-needed conversation with a friend who has met us here. There are many good specimens to choose from; we make sure to pick ones that are ripe but not mushy and always inspect them for insect damage. I do not begrudge the insects their taste of the red sugary fruit, but am careful to leave them in the field with their half eaten meal. My 4 year old wanders around eating her share of the hot sweet berry. I take my first sample after picking for a while, waiting for the one that I cannot resist. It is the perfect strawberry, shaped just right and bulging with ripe juice. I bite slowly into the succulent berry leaving only the stem in my fingers. I flick the stem into the next row as the strawberry melts in my mouth. It is warm from the sun and sweet on my tongue, making the saliva rush into my mouth from the glands, disintegrating with the slightest pressure. This is how they are to be eaten, hot from the field, but we only get this pleasure once a year. “I filled another one Mom.” Olivia’s voice gently pulls me out of my strawberry induced trance. What help she is now, unlike Sylvia who’s tummy is full and who is insisting that I eat the berries she’s picked just for me, making sure that I am eating my share. We have soon picked all we need and start helping fill my friend’s basket, as she doesn’t have a helper yet. Her son is only 2, and he is delighting in the feeling of squishing the hot juicy berries in his hands. She tries to give him ones that the insects had for their lunch so that the perfect ones don’t end up on the palm of his hand or running down his leg. On the ride home we feel full of more than just berries; we have accomplished much…16 quarts of strawberries in a little over an hour and a half. On the way home we also stop at another farm to buy fresh local whipping cream. At home I stir up some biscuits, and we are tempted to skip dinner and just eat the fresh strawberry shortcake as our meal. At the end of the day, 8 quarts of fresh strawberries are chilling in the freezer getting ready to provide us with their fresh taste for our smoothies or on our waffles this fall, winter, and into the spring. 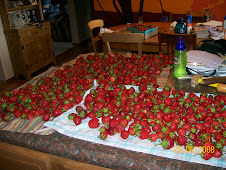 With the rest of the berries we will make jam, strawberry sorbet, and eat as many as possible while they are fresh.